Profound quotes on history, humanity and the nature of the psychedelic experience by the American psychonaut and author Terence McKenna, sampled from his influential non-fiction book The Archaic Revival. 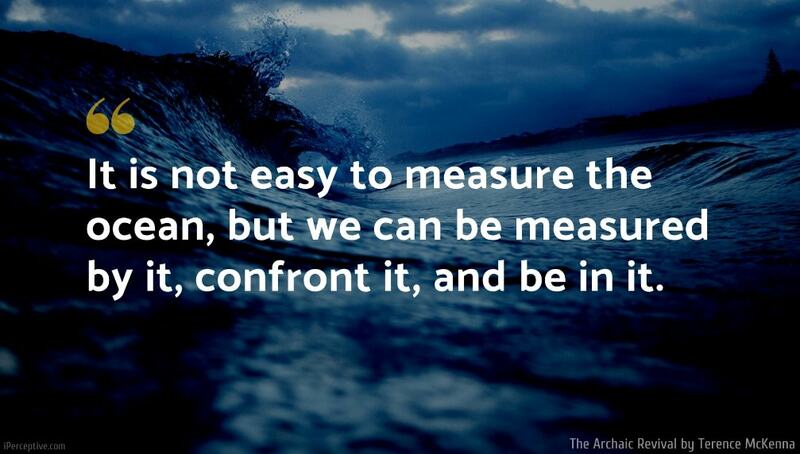 It is not easy to measure the ocean, but we can be measured by it, confront it, and be in it. One exists in eternity, one has become eternal... One is then apart from the moving image; one exists in the completion of eternity. 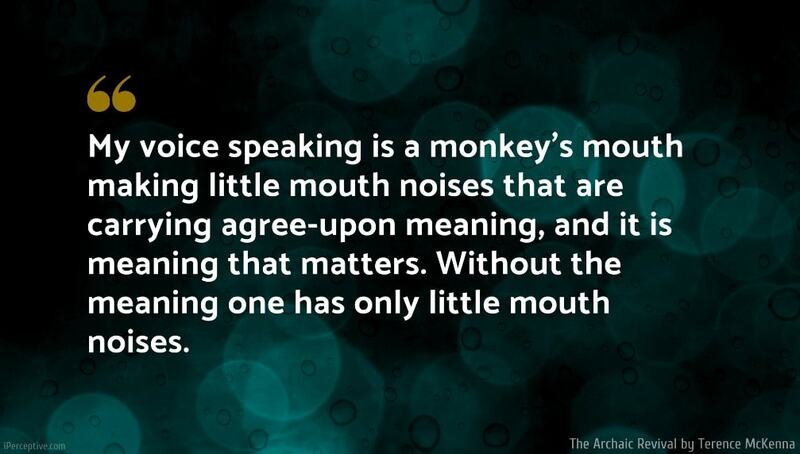 My voice speaking is a monkey's mouth making little mouth noises that are carrying agree-upon meaning, and it is meaning that matters. Without the meaning one has only little mouth noises. We humans may be released into a realm of pure self-engineering. The imagination is everything... This is where we came from. This is where we are going. And it is only to be approached through cognitive activity. 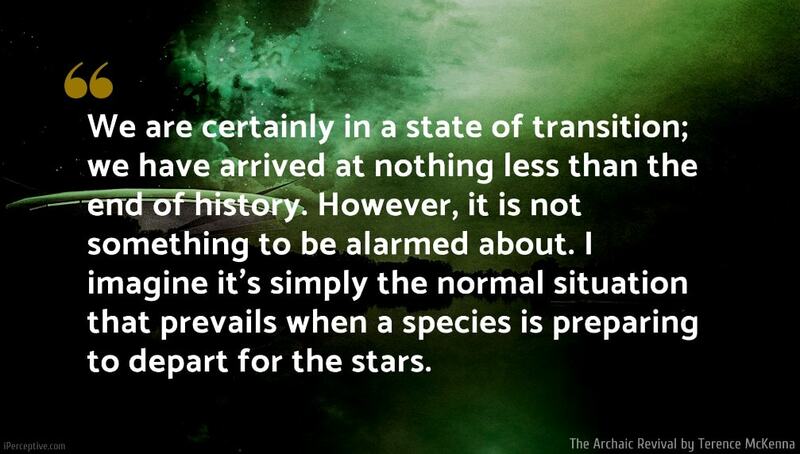 We are certainly in a state of transition; we have arrived at nothing less than the end of history. However, it is not something to be alarmed about. I imagine it's simply the normal situation that prevails when a species is preparing to depart for the stars. I believe that psychedelic research is not a peripheral historical backwater. Psychedelics are not a breakthrough primarily directed at the neurotic or the mentally ill. They are literally "the new world." Land has been sighted in hyperspace. We now have four or five hundred years of exploration ahead of us. Now, why should taking a natural psychedelic drug compound like psilocybin give you hope? It's because it connects you up with the real network of values and information inherent in the planet, the values of biology, the values of organism, rather than the values of the consumer. 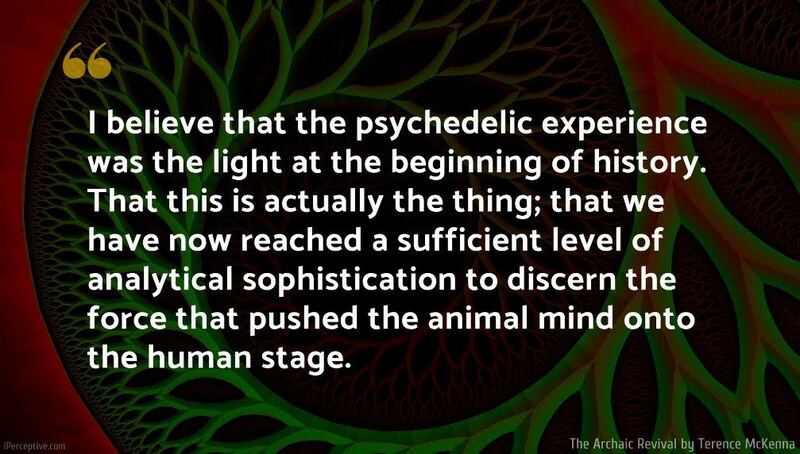 I believe that the psychedelic experience was the light at the beginning of history. That this is actually the thing; that we have now reached a sufficient level of analytical sophistication to discern the force that pushed the animal mind onto the human stage. It is a process that, once it is set into motion, will not end. It is as though these botanical hallucinogens were exohormones, message-bearing chemicals shed by Gaia to control the development of the historical process in the catalytic trig- ger species that is introducing change on the planet. It isn't merely a matter of noetic archaeology that we have now learned something about the past. This is also true of Albert Hofmann's discovery about Eleusis; this may ultimately have a greater impact than the discovery of LSD it- self. It is a discovery of a skeleton in the closet. There are skeletons in the closet of human origins and of the origin of religion. I would wager that these skeletons are all plant psychedelics. If we can come to terms with them, we can begin to understand the shape of the human future. The psychedelic experience is not easy to measure. It appears to be a world nearly as large as the previous domain of nature. It is not simply the Jungian collective unconscious — the repository of all human species' experience — still less is it the Freudian notion of the repository of memories of individual experience. It seems that what Freud and Jung thought of as a place in the organization of the psyche is cognized in the shamanic model as a place, a nearby, adjacent dimension into which the mind can project itself and, by self-scaling itself to these interi- or dimensions, experience them as realities. My testimony is that magic is alive in hyperspace. It is not necessary to believe me, only to form a relationship with these hallucinogenic plants. 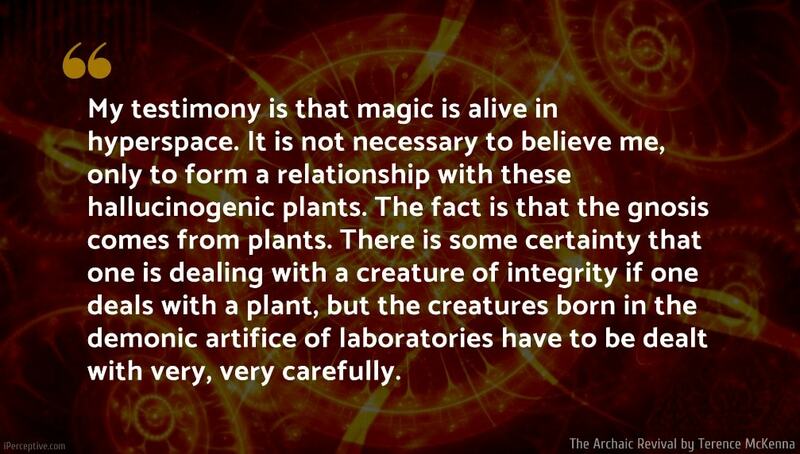 The fact is that the gnosis comes from plants. There is some certainty that one is dealing with a creature of integrity if one deals with a plant, but the creatures born in the demonic artifice of laboratories have to be dealt with very, very carefully. DMT is an endogenous hallucinogen. It is present in small amounts in the human brain. There is a spiritual obligation, there is a task to be done. It is not, however, something as simple as following a set of somebody else's rules. The alternative physics is a physics of light. Light is composed of photons, which have no antiparticle. This means that there is no dualism in the world of light. Unfortunately, religion for the past five hundred years has been a hierarchical pyramid at whose top were theologians interpreting dogma. This interpretation was handed down through a hierarchy to the faithful. I think religious hierarchies are very unsettled by the idea of direct revelation. Nevertheless, this phenomenon is certainly thriving in pre-literate cultures all over the world. We discovered in dealing with this that the only people you could talk to about it or who seemed to have familiarity with it were shamans. People in the Amazon insist on the importance of chanting as a vehicle of expression when on tryptamine hallucinogens. This is a vital point, since in some way sound can control the topology of the hallucinations. We need to shed our inhibitions and experiment with sound and tone in the presence of these compounds. I have long felt this but have been uncertain as to how to proceed; the style of chanting of the ayahuasqueros is a beginning. Being monkeys, when we encounter a translinguistic object, a kind of cognitive dissonance is set up in our hindbrain. We try to pour language over it and it sheds it like water off a duck's back. We try again and fail again, and this cognitive dissonance, this "wow" or "flutter" that is building off this object causes wonder, astonishment, and awe at the brink of terror. One must control that. And the way to control it is to do what the entities are telling one to do, to do what they are doing. For the Eschaton, positioned in eternity, all things are somehow coexistent in time or outside of time. All events.have already happened. Shamanism is a formal technique for viewing this hyperdimensional object outside of time in a three-dimensional way, by transecting it many, many times until an entire picture of it emerges. The mushroom evokes a profound planetary consciousness that shows one that history is a froth of artifact production that has appeared in the last ten to fifteen thousand years and spread across the planet very quickly. But mind in human beings precedes the history of technology and goes back into the archaic darkness. One of the things we were saying in The Invisible Landscape is that there are avenues of understanding in the human body that have not been followed because of epistemological bias; for instance, using voice to effect physiological change in one's own nervous system. This sounds on one level preposterous, but on the other hand, it is simply a formalized way of noting the fact that sound is energy, that energy can be transduced in a number of ways, and that when it is directed toward the body it obviously does make changes. Chanting and singing are world-wide shamanic practices. The shamanic singers navigate through a space with which we have lost touch as a society. But technology is the real skin of our species. Humanity, correctly seen in the context of the last five hundred years, is an extruder of technological material. We take in matter that has a low degree of organization; we put it through mental filters, and we extrude jewelry, gospels, space shuttles. This is what we do. We are like coral animals embedded in a technological reef of extruded psychic objects. All our tool making implies our belief in an ultimate tool. That tool is the flying saucer, or the soul, exteriorized in three-dimensional space. I think there's a very strong Calvinistic bias against a free lunch. The idea that you could achieve a spiritual insight without suffer- ing, soul-searching, flagellation, and that sort of thing, is abhorrent to people because they believe that the vision of these higher dimensions should be vouchsafed to the good, and probably to them only after death. It is alarming to people to think that they could take a substance like psilocybin or DMT and have these kinds of experiences. 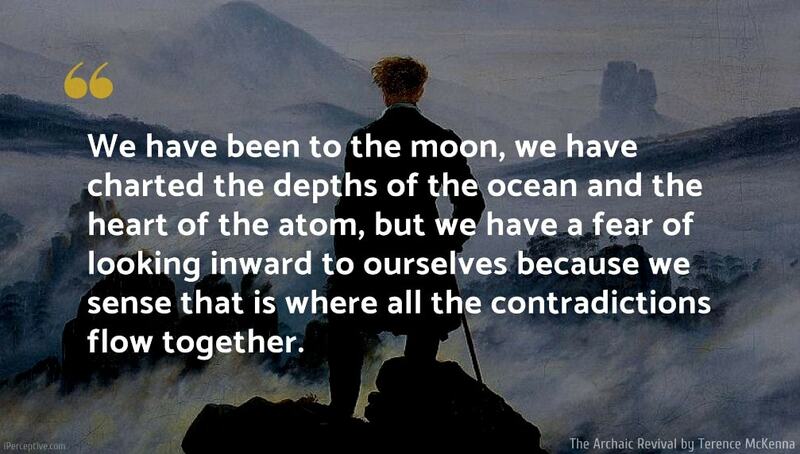 Nevertheless, it is a fact of reality that we are only now beginning to come to terms with. I don't believe that these things are a substitute for spiritual practice. On the other hand, I don't believe that spiritual practice could ever be a substitute for these experiences. The only experience of time that one can have is of a subjective time that is created by one's own mental processes, but in relationship to the Newtonian universe there is no time whatsoever. One exists in eter- nity, one has become eternal, the universe is aging at a staggering rate all around one in this situation, but that is perceived as a fact of the uni- verse — the way we perceive Newtonian physics as a fact of this uni- verse. One has transited into the eternal mode. One is then apart from the moving image; one exists in the completion of eternity. One of the reasons I like to make this argument about the mushroom and the extraterrestrial is to show people how one can see things differently. If things can be seen that differently, how many ways can they be seen differently? Try to get people to stop waiting for the presi- dent to enlighten them. Stop waiting for history and the stream of histor- ical events to make itself clear to you. You have to take seriously the notion that understanding the universe is your responsibility, because the only understanding of the universe that will be useful to you is your own understanding. It doesn't do you any good to know that some- where in some computer there are equations that perfectly model or per- fectly don't model something that is going on. We have all tended to give ourselves away to official ideologies and to say, "Well I may not understand, but someone understands." The fact of the matter is that only your own understanding is any good to you. Because it's you that you're going to live with and it's you that you're going to die with. As the song says, the last dance you dance, you dance alone. I think you have to take the view that certainly the planet is the cradle of mankind, but, inevitably, one cannot remain in the cradle forever. The human imagination, in conjunction with technology, has become a force so potent that it really can no longer be unleashed on the surface of the planet with safety. The human imagination has gained such an immense power that the only environment that is friendly to it is the vacuum of deep space. It is there that we can erect the architecton- ic dreams that drive us to produce a Los Angeles or a Tokyo, and do it on a scale and in such a way that it will be fulfilling rather than degrad- ing. So, yes, I think we cannot move forward in understanding without accepting as a consequence that we have to leave the planet. We are no longer the bipedal monkeys we once were. We have become almost a new force in nature. I think of language and cybernetics as an amalgam of computers and human brains and societal structures that has such an enormous forward momentum that the only place where it can express itself without destroying itself is, as James Joyce says, "up n'ent." A new science that places the psychedelic experience at the center of its program of investigation should move toward a practical realization of this goal — the goal of eliminating the barrier between the ego and the Overself so that the ego can perceive itself as an expression of the Overself. Then the anxiety of facing a tremendous biological crisis in the form of the ecocrises, and the crisis of limitation in physical space forced upon us by our planet-bound situation, can be obviated by cultivating the soul and by practicing a new shamanism using tryptamine-containing plants. Psilocybin is the most commonly available and experientially ac- cessible of these compounds. Therefore my plea to scientists, administra- tors, and politicians who may read my words is this: look again at psilocybin, do not confuse it with the other psychedelics, and realize that it is a phenomenon unto itself with an enormous potential for transform- ing human beings — not simply transforming the people who take it, but transforming society in the way that an art movement, a mathematical understanding, or a scientific breakthrough transforms society. It holds the possibility of transforming the entire species simply by virtue of the information that comes through it. Psilocybin is a source of gnosis, and the voice of gnosis has been silenced in the Western mind for at least a thousand years. I think that to some degree science has betrayed human destiny. We have been led to the brink of star flight, but we've also been led to the brink of thermonuclear holocaust. The result of this betrayal is that science may well be swept away by the revelation of the UFO. Scientists have always been like the apostle Thomas, wanting to put their hands into the wound of the incorporeal body. If the wound is offered, if the saucer comes and is seen by millions of people, scientists will be the first to be converted. We should be forewarned and act now to preserve our freedom of thought by deconditioning ourselves to the lying saucer revelation before it happens. A religion operates by the law of large numbers, and, as long as 80 percent of the people believe, it can transform a civilization. But it is possible to be one of the 20 percent who don't believe, to stand where the high water never reaches. A voice that gave guidance and revelation to Western civilization has been silent for about seventeen hundred years. This is the Logos and all ancient philosophers strove to invoke it. For Hellenistic philosophy it was a voice that told self-evident truth. 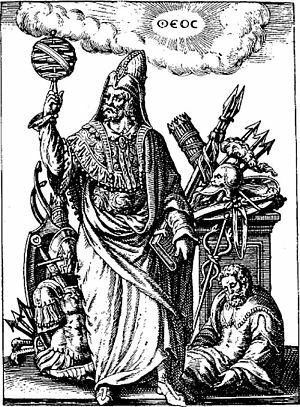 With the passing of the Aeon and the death of the pagan gods, awareness of this phenomenon faded. However, it is still available through the mediation of the plant teachers. If we could intelligently examine dimensions that the psychedelic plants make available, we could contact the Oversoul and leave behind this era where dominance hierarchies must be disciplined by UFOs and messiahs, and where progress is halted for millennia be- cause culture cannot advance ethics at the same rate as technology. If we could have a dialogue with the Other, we would understand all these things and begin to contact the Tao of the ancestors. Perhaps we would develop a shamanic alternative in which trained people mediate the group experience that is available from psychedelic plant use. 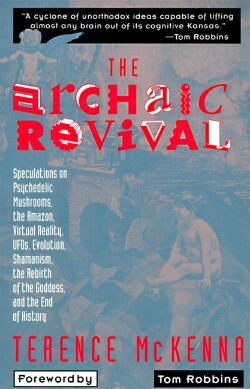 The Archaic Revival is a book written by the American psychonaut and ethnobotanist Terence McKenna. The book explores the nature of psychedelics, UFOs and the history and future of humanity.